F-Series deliveries, aided by improved availability of the redesigned F-150 truck, hit a high for the year with sales of 71,332, a gain of 4.7 percent over August 2014. U.S. light-vehicle sales slipped 0.6 percent, far better than projections of a 3.3 percent dip, to 1.505 million in August as consumers shrugged off volatile stock prices and continued to splurge on new cars and light trucks. The seasonally adjusted annualized sales rate soared to 17.81 million, the highest pace since July 2005, when employee-style discounts drove volume, and the strongest month of the 6-year recovery. Deliveries, led by crossovers and SUVs, have now advanced 3.9 percent to 11.6 million vehicles in 2015 and appear well poised to surpass 17 million for only the third year ever. U.S. sales had increased 4.5 percent through July. Because of a calendar quirk that means Labor Day holiday volume will be included in September results this year, August 2015 deliveries across the U.S. had been projected to drop to about 1.53 million cars and light trucks, based on the average estimate from five analysts polled by Bloomberg. There were 26 selling days last month, one fewer than in August 2014. The seasonally adjusted annualized sales rate for August was projected to come in at 17.3 million, flat with the August 2014 rate, based on the estimates of 12 analysts compiled by Bloomberg. The SAAR has now topped 17 million five out of seven months this year, including 17.55 million in July. Among major automakers, Ford Motor Co. and Fiat Chrysler Automobiles posted August gains while their biggest Japanese rivals fell amid a solid month for U.S. demand despite some statistical quirks. Ford's volume rose 5.7 percent, while FCA eked out a 1.7 percent advance and General Motors dropped slightly. Toyota Motor Corp., Nissan Motor Co. and Honda Motor Co. all posted declines as well. 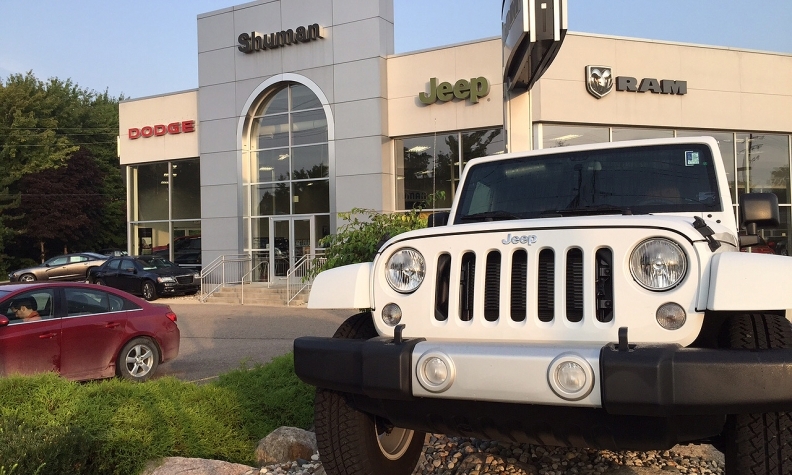 “In spite of a tough 2014 comparison and extreme stock market volatility, our dealers' competitive spirit kicked in and propelled us,” Reid Bigland, head of U.S. sales for Fiat Chrysler, said in a statement. August sales slipped 8.8 percent at Toyota Motor with demand falling 9.7 percent at the Toyota brand and skidding 37 percent at Scion. But Lexus volume advanced 2.1 percent to a monthly record of 33,487 -- giving the brand its second consecutive monthly luxury title. "The luxury market continued its hot streak last month," said Jeff Bracken, group vice president and general manager of Lexus. Honda Motor's August deliveries dropped 6.9 percent on a 7.5 percent decline at the Honda brand and a 1.1 percent dip at Acura. At Nissan Motor, volume slipped 0.8 percent on a 2 percent decline at the Nissan division. Sales surged 16 percent at Infiniti. Subaru, overcoming low inventory levels, set a monthly record in the U.S. with August deliveries of 52,679 vehicles, a gain of 4.9 percent over August 2014, and enough to top the record set in July (50,517). The XV Crosstrek and Forester both set monthly sales records, as well, in August. Subaru's U.S. sales have now increased 45 consecutive months, year over year, and topped 40,000 vehicles a month for 18 straight months. Fiat Chrysler’s winning streak had been in doubt in part because sales during the Labor Day holiday were not included in August results this year, in contrast to the previous three years. Analysts polled by Bloomberg, on average, expected FCA’s sales to drop 1.2 percent during the month. FCA said Jeep deliveries rose 18 percent to 80,804 in August, an all-time record for the brand and its 23rd consecutive monthly gain. Volume rose 6.1 percent at the Ram brand and 0.8 percent at Fiat, but sales slipped 15 percent at Dodge and 14 percent at the Chrysler brand. Ford Motor was helped by strong demand for crossovers and F-series pickups. Volume advanced 5.6 percent at the Ford brand and 6 percent at Lincoln. F-Series deliveries, aided by improved availability of the redesigned F-150 truck, hit a high for the year with sales of 71,332, a gain of 4.7 percent over August 2014. Sales of utility vehicles climbed 12 percent while car volume skidded 7 percent, Ford said. At GM, deliveries fell 0.7 percent. Volume was off 1.5 percent at Chevrolet and 5.5 percent at Cadillac; deliveries increased 3.5 percent at GMC and 0.6 percent at Buick. GM's retail deliveries rose 6 percent. The company, citing J.D. Power data, said it had the industry’s largest retail sales increase and gained more than 1 percentage point of retail market share last month. Audi rode a 41 percent jump in crossover volume to post sales of 18,794 in August, a 9.9 percent gain and its 56th-consecutive monthly U.S. sales record. The Q5 compact CUV, Audi’s top-selling nameplate this year, posted a 34 percent increase while Q3 subcompact CUV deliveries more than quadrupled to 1,189. Mazda reported 29,938 sales, down 4.4 percent, as the Mazda3, Mazda6 and CX-5 suffered slight declines. The automaker tallied 698 sales of its new CX-3 crossover, which went on sale in mid-August as a rival to the Honda HR-V. The redesigned MX-5 Miata claimed 1,344 sales in its first month, more than triple year-earlier volume. Jeep's U.S. deliveries rose 18 percent to 80,804 in August, an all-time record for the brand and its 23rd consecutive monthly gain. Sales generated during the four-day Labor Day holiday period, Friday through Monday, represented 20 percent of light-vehicle deliveries in August 2014, J.D. Power and Associates estimates. And a late-month surge produced the highest light-vehicle volume in August 2014 than any August since 2003. Low gasoline prices, steady employment growth and favorable financing continued to support new-vehicle demand last month. But while consumers largely shrugged off volatile U.S. stock prices in late August, the market turmoil may have impacted some luxury segments, analysts say. Kelley Blue Book noted on Monday that average transaction prices in August for high-performance cars, such as the BMW 6 series and Porsche 911, fell 1.6 percent from July and 3.7 percent from August 2014. And average transaction prices for high-end luxury cars dipped 3.4 percent last month compared with August 2014. Dealers and automakers also ramped up discounts on remaining 2015 models, notably small- and mid-size cars, and large pickups. A Buick Encore lease for $190 a month and $190 down for 24 months for current lessees of a non-GM vehicle. A 2015 Honda CR-V LX lease for $209 per month for 36 months and $1,999 down. Zero-percent financing for 72 months, and $1,000 bonus cash, on most 2015 Ford models. In Montana, some Toyota dealers dangled $2,000 cash back on the 2015 Toyota Avalon and Venza, and $2,500 in cash off the Toyota Prius hybrid. In Baltimore, Fiat Chrysler’s Ram brand pitched a 2015 1500 Big Horn Crew Cab with zero-percent financing for 60 months and a $2,750 cash allowance. A 2015 Volkswagen Tiguan lease for 36 months with monthly payments of $179 and $2,499 down. Up to $3,520 off a 2015 Fiat 500 Abarth as part of the manager’s specials at Golling Fiat in Birmingham, Mich.
Brian Johnson, an analyst with Barclays, said last week big pickup incentives in August were running nearly 13 percent higher than a year ago, and nearly 5 percent higher than July. 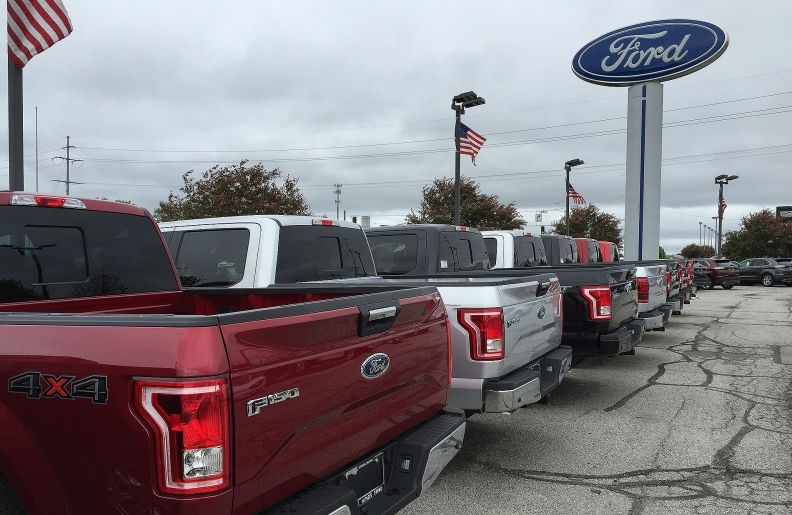 “Competition is intensifying in the large pickup space as Ford’s F-150 inventory further normalizes,” Johnson said. Even with a slew of clearance deals, transaction prices remain healthy. Kelley Blue Book estimates the average transaction price for a new light vehicle sold last month was $33,543, an increase of $1,107, or 3.4 percent, from August 2014, but down $79, or 0.2 percent, from July. “September will be a telling month depending on the impact of Labor Day sales and wavering financial markets,” said Akshay Anand, an analyst for Kelley Blue Book. John Irwin, Nick Bunkley and Ryan Beene contributed to this report.